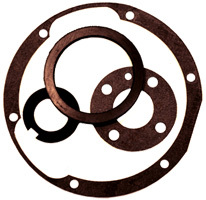 Cardinal Rubber & Seal, Inc., provides custom gasket cutting services. We can meet your custom gasket needs with hand-cut, die cut, KnifeJet, and WaterJet precision cut gaskets made to your specifications. We offer 24-hour emergency services, same-day quotes, and OEM gasket duplication. Cardinal Rubber & Seal is proud to be one of the pioneers of WaterJet gasket cutting technology, which allows us to cut gaskets precisely and accurately with numerically controlled WaterJet machines. Whether you need sheet, strip, extruded shapes, or geometric figures such as circles, rectangles, etc., Cardinal can meet your needs for made-to-order rubber products. Precision and accuracy up to +/- 0.005"